Ecology examines the relations between living organisms and their environment, and it is not surprising that the relationship between or among species sharing the same ecosystem affects one another. At one end, the nature of this interaction can benefit one species at the expense of the other, to the other extreme each can benefit from the interaction. In his Origin of Species (1859), Darwin noted that the struggle for survival was greatest among members of the same species because they possess similar phenotypes and niche requirements. WHAT’S IN A RELATIONSHIP? Predation and parasitism are situations in which only one species profits from the interaction, while another species pays the price. Predation represents the ultimate extreme of an ecological interaction, in which one species captures and feeds on another, as an owl kills a field mouse or the carnivorous pitcher plant catches insects. In a somewhat less extreme instance—parasitism—one species (the parasite) benefits at the expense of the other (host), which derives no benefit from the interaction, as when tapeworms inhabit the intestines of a vertebrate host. Intracellular parasites, such as protozoa or bacteria, often rely upon a vector to transport the parasite to its host; the anopheles mosquito conveys the malaria-carrying protozoan parasite to its human host, for example. In commensalism, one species receives benefit from another, which does not suffer adversely from the interplay. The remora, a tropical open-ocean-dwelling fish, lives symbiotically with sharks and eats the shark’s leftover food. The fierasfer is a small, slender fish that lives inside the cloacal cavity (the lower end of the alimentary canal) of the sea cucumber to protect itself from predators. The most equitable of all interactions is mutualism, in which each species provides resources or services to the other resulting in mutual benefit. Lichen is a plant that results when a green alga lives symbiotically with a fungus, where the fungus gains oxygen and carbohydrate from the alga, which reciprocally obtains water, carbon dioxide, and mineral salts from the fungus. SEE ALSO: Algae (c. 2.5 Billion BCE), Fungi (c. 1.4 Billion BCE), Nitrogen Cycle and Plant Chemistry (1837), Darwin’s Theory of Natural Selection (1859), Malaria-Causing Protozoan Parasite (1898). 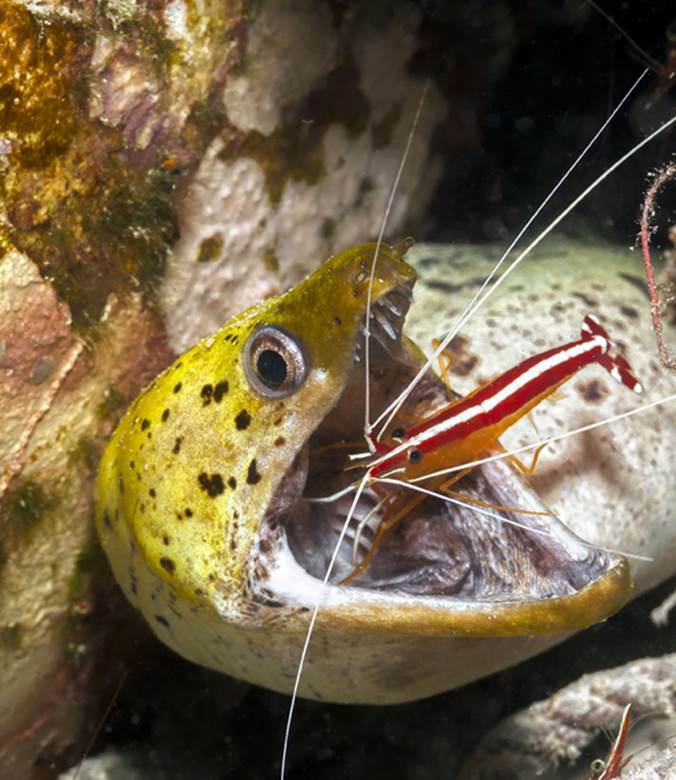 In this example of mutualism, a cleaner shrimp is cleaning parasites from the mouth of a moray eel. The fish benefits by having the parasites removed, and the shrimp gains the nutritional value of the parasites.